Foams can extract, say, proteins from a dilute solution and concentrate them in a remarkably effective process. This expert-level app shows how it can be done. 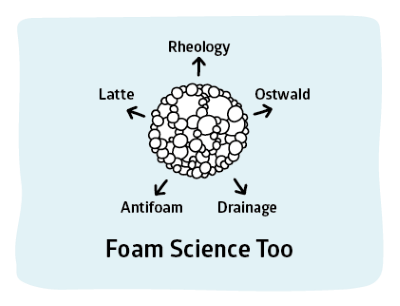 We also know that when a foam is generated, much of the water drains away between the bubbles. So all that surface excess of the agent is sitting in an environment with rather little of anything other than air. So if the foam can be extracted then broken, it is likely that the concentration of the surface active agent in the resulting fluid is considerably higher than the original. An example is that the concentration of protein in Guinness beer is 0.3% but the concentration of protein in the foaming head is 73%. When this is done methodically to remove a surface active agent from a bulk liquid the process is called foam fractionation. To continue the focus on alcoholinc drinks, the aroma of champagne is considerably enhanced because the bubbles fractionate the aroma chemicals from the bulk and when they explode at the surface they eject the aroma into our olfactory system. 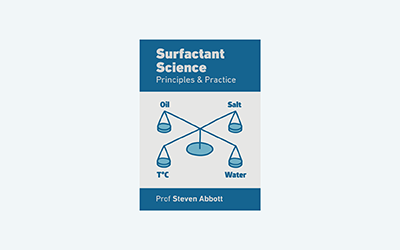 The standard reference on foam fractionation1 is by Stevenson and Li and I am grateful to Drs Stevenson and Li for their kind support in creating this app. Of necessity this app simplifies many points that are explained at length in the book. As per the diagram (based on Fig 6.3 in the book) we assume that air is being bubbled into a column of liquid and the bubbles of radius r (Sauter mean for those who attend to such details) rise with a superficial velocity jg. [The "real" velocity is jg/Φ where Φ is the volumetric gas fraction in the bubbles. So when φ is 0.1 the real velocity is 10xjg.] 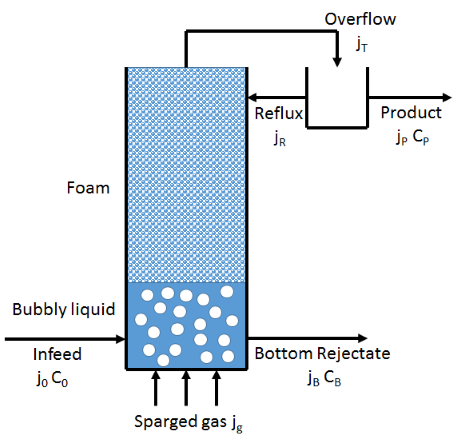 Liquid with surface agent concentration C0 is being pumped in at a rate j0 and the depleted liquid at concentration CB is removed from the bottom at a rate jB and the product at concentration CP is removed from the top (i.e. in the foam) at a rate jP. The surface flux jS is calculated from jP and r via jS=3jg/r. Two more simple "balance" equations finish the job. Because j0=jP+jB, i.e. the input flow is the same as the sum of the product flow and the bottom flow, and because we know the first two, jB can be calculated. And j0C0=jPCP+jBCB, i.e. the total amount of the surface active agent going in is the same as that going out. By substituting CP by the equation above we can solve the equation for the one remaining unknown, CB. Well, not quite. We need two more values. A common trick in all such processes is to "reflux", to send some fraction χ of the product stream back into the system. This returned material needs to equilibrate with the stream of material rising through the common and it is common to define a number "theoretical plates" or "theoretical units" in the system which depend on many factors. It is too complex to describe the theory here (please refer to the book), but you can choose a value of χ and an NTU (Number of Theoretical Units) between 1 and 4. Of course if χ=0, with no reflux, then you get the values calculated via the above procedure. Indeed, these values are the starting point for the iterative solver and are provided as useful reference outputs. When χ is non-zero then jP is replaced internally by jT for the flow from the top of the foam column and we need jR = χjT for the reflux flow. Obviously our product flow is now given by jP = (1-χ)jT. Because the effect of χ is described by the graph, neither jT nor jR is provided as an output, but can readily be derived manually for any specific χ. At present it does not seem possible to know how many NTU one might have in a column so it is wise to assume at most 2, given that other assumptions such as perfect mixing and equilibration are unlikely to hold, making the idealised calculation over-optimistic. You can go up to 4 if you wish, but the numerics are more precarious. My first implementation of the Stevenson and Li algorithm was numerically most inelegant and slow. I am most grateful to Dr Li for providing the code for a more elegant and faster algorithm. Responsibility for errors is mine. Despite simplifications (e.g. that the bubbles are of a known single radius), reservations (e.g. about the number of NTU) and numerical glitches at some settings, this is still a very powerful tool for scientists and engineers to think through the tradeoffs that every production system faces. The absolute numbers are unlikely to be correct, but the trends will be correct and such an approach, in such a complex system, will almost always out-perform "intuition". 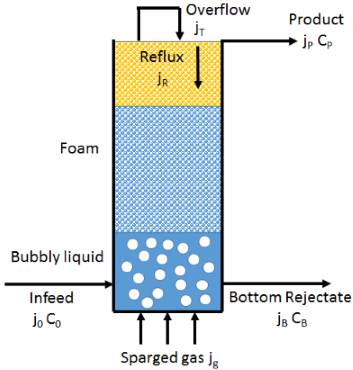 An alternative to the external reflux is to do the same thing via an internal reflux where a portion of the foam is made to collapse towards the top of the column, achieving, in theory, exactly the same as external reflux with a simpler physical arrangement. The issue, of course, is that collapsing the bubbles in a controlled manner (e.g. by encouraging Ostwald ripening or coalescence) is hard to do, especially when playing with other settings at the same time. The diagram, therefore, is a highly stylised aspiration rather than a specific suggestion.